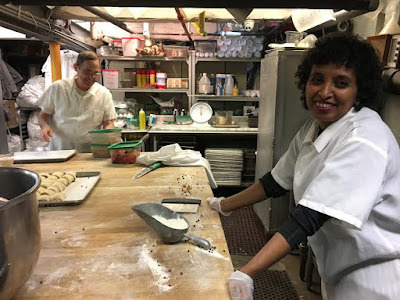 Veselka is one of 13 NYC businesses that the Columbia Aging Center — part of Columbia University's Mailman School of Public Health — is honoring today for its efforts to hire and retain workers over the age of 50. 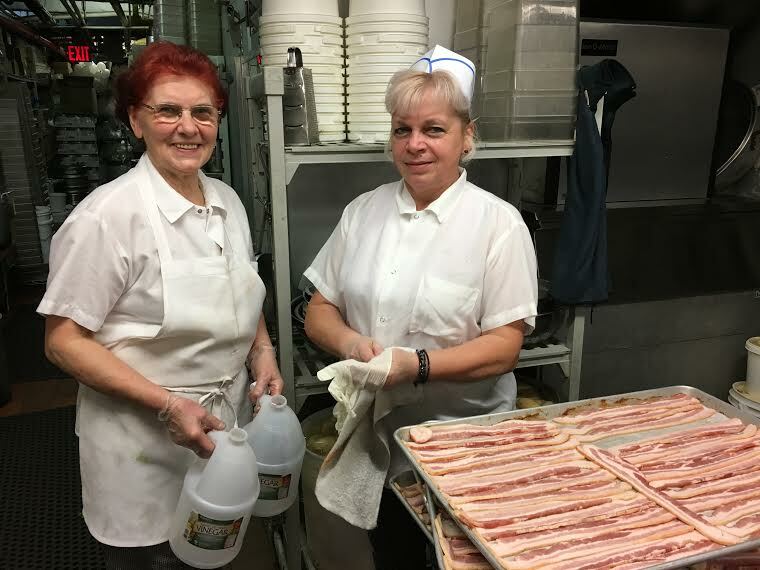 We have a soup cook who has been with us for 30-plus years who is extremely devoted to her work. When I hired her she lived down the street from Veselka and walked half a block to work every day. As their family grew, she and her husband bought a home in Perth Amboy, N.J. So she has been commuting by bus and train every day since they moved. In spite of the long distance and difficult commute, she comes to work on time every day without complaint. One of her younger co-workers commented that even a war would not keep her from showing up and making her borscht. She and I are the same age, 71, so I guess I have a special place in my heart for mature people and I especially appreciate the opportunity to continue to do the work I love. A rep for the Columbia Aging Center listed several reasons (many of the practices benefit all workers regardless of age) about what makes Veselka, which opened in 1954, such a good employer of people 50 and over. Those practices include strong benefits, opportunities for advancement, responsiveness to employees’ ideas to improve the work environment, a culture and atmosphere that demonstrates workers are valued, educational opportunities and flexible work arrangements. Specifically, Veselka offers health insurance to its employees and pays 60 percent of the cost of it, which the Columbia rep said is unusual in the restaurant business. They also have a profit-sharing program, paid vacation time and a meal plan that lets employees eat whatever they want for $2.50 a meal. In addition, Veselka offers opportunities for advancement. For instance, prep cooks have risen up the ranks, including one who is now their executive chef. Veselka paid to send him to culinary school. Said Birchard: "We are honored to be considered for this recognition but we have also been honored over the years to have had the privilege of working with some incredible people." HELL. YES. way to do it on all fronts! Kudos to Veselka and I like Tom's response. Awards such as this seem to be a excellent idea as they will encourage patronage of places that treat their employees well. Awesome post! No wonder their soup is so good--experience! 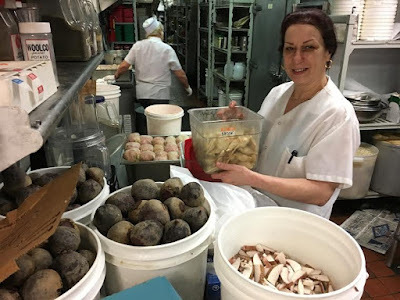 I have enjoyed so many bowls of borscht (and other great meals) here so it is fantastic to get a peek behind the scenes. Cool to hear from Tom Birchard, I didn't realize he has been running the show for such a long time. I give Veselka crap for becoming part of the hollywood in-crowd and whatever, but it is fantastic. A cornerstone of the EV. Congratulations. Veselka is a landmark and an anchor of the EV. Great food, great prices, great owners, great employees, great location. So....GREAT. None to any ageist business! Looove the chicken soup. Now happier to pay $$ for it!! This is such a wonderful story. I turned 50 recently, and I am not employed. It is so difficult to get hired even when you hit 40. Veselka rocks! I've been coming here for over 40 years! They anchor the block and provide so much service and stability to our neighborhood. They have always been supportive of the 9th Street small businesses, and are a great neighbor for us all. Good food never goes out of style! Thank you to Veselka, and the Birchard family, a true family business and a great member of our business family! I have been eating at Veselka since I moved to the EV in 1968. And bringing all my out-of-town friends there as well. Thanks to the staff and owners, who do such a terrific job of feeding us. to read about the other recipients. It would be good to get the word out about this award as a reminder to fledgling businesses that don’t consider the contributions and assets of older workers. Wonderful, warms my heart! If only more employers were so thoughtful and caring! Cheers to Veselka. I can't get hired and am over 50. So frustrating. When I can afford will go there again. I've been hanging out there for soooo many years. Great vibe. Long may they turn a profit! Love Veselka. I'm in my mid-40s and was just telling a friend about how a fashion-forward younger friend needs to take me shopping for a job interview outfit. I need to look more millennial! Nice! Despite ageism which is alive and well! Я тішуся на такий добрий бізнес! Я там навіть був 50 років тому! Знаменито!!! Real food at a real place = Veselka!!! I am SO PROUD of Veselka and Tom Birchard. The award is SO DESERVED! makes me want to eat there more often support this venue, it's reality and its people! Just when I thought that nothing could make me love Veselka more . . .! I understand. At 55 I was hired at Costco and I'm not the only older employee. If you can apply. Go meet the store manager. Don't give up. Hopefully you get hired soon. Costco starts at $13 an hour. Get hired at a bad job such as McDonald's or Wal-Mart at minimum wage. It is a lot easier to get a good job if you are already have a job. Good luck!